After a good night’s sleep we go down to the breakfast we know all too well. Katja made oatmeal in the room and we order the standard egg and toast breakfast for me. The staff at the breakfast smiles and welcome us back, which is nice. There’s one infant in the hotel, but damn, it sounds like there are plenty of them. Poor parents. Katja run of to do yoga while I work on the blog. We try to come a jour again now that we have time between yoga and training. We’ve seen most of the sights around here so the hours between training will be spent on reading. For my part more technical documents and less fiction. When Katja came back we went out to rent a motorbike. I want a real bike since I’m driving to pencak silat training most days we’re here. We end up renting the bike of one of the hotel staff. A 150cc. It’s enough power and good handling. I’m happy. The virgin ride is aimed at the babi guling place we love down the road. Oh, what sweet taste. I have two portions and love ’em both. We take back roads from the warung and back to Ubud center where we have coffee at Anomali coffee. Rough and tough coffee. Lovely. We do a little shopping on the way back and restock on fruits, water and yogurt. With just a little fridge there no way we don’t have to shop daily. Katja’s dream, in other words. We go for a yoga class together at four. Bex is teaching a vinyasa flow class and we’re both fond of Bex as a teacher. Katja’s upcoming teacher in her teacher training was in this morning’s class and this one. Les is very good, naturally, and seeing him effortlessly move in and out of poses is both irritating and motivational. 49 / 51 I guess. At least I tell myself that. The class is good, but I feel the time that has passed since my last yoga session. A few things were really hard. Like really really hard, but I hope the forthcoming days will remedy that. I have booked a pencak silat private session with Bagus from Bakti Negara on Wednesday. That gives me the opportunity to do Tight Guy yoga tomorrow. That sounds like a class that suits me. After training we went home and I had a Skype session with my boss. There’s a lot of reorganizing going on in the company so there’s still in the blue what I’ll do when I get back. Time will show. Then it’s time for dinner and we go to Mama Mia pizzeria. It’s so good so damn good. Aiaiai. I enjoy every skewed chewed bite. 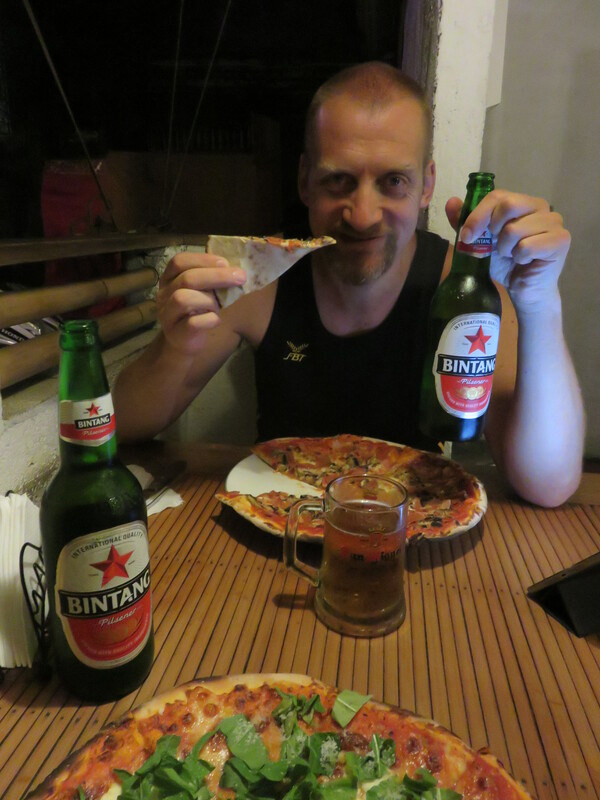 We down a couple of Bintang with the pizza. We’ll go non-alcohol when Katja is on the course, so this is one of the few will do here in Ubud. Got to say that Bintang is one of the best beers I’ve had here in Asia. A bowl of fruit with a couple of episodes on TV ends what must be said to be a perfect day.